The Castlevania series of platform games are mostly all excellent, each time Konami released a new one I would immediately buy and love them. There has not been a Castlevania game in a long, long time now due to the company no longer committed to making video games. To fill that void thankfully a Kickstarter was launched to make a spiritual successor to it with the director of the very best one; Castlevania: Symphony of the Night in charge. The campaign was beyond successful and so a modern Metroidvania style horror action game is due to be released titled Bloodstained: Ritual of the Night. In the meantime a prequel to this game was made, Bloodstained: Curse of the Moon was designed in a retro style, to emulate the original NES games. So we get old fashioned graphics with limited palettes, and chip tunes. You play as a cursed man named Zangetsu who hunts demons in order to try and find a way to lift the curse they placed on him. 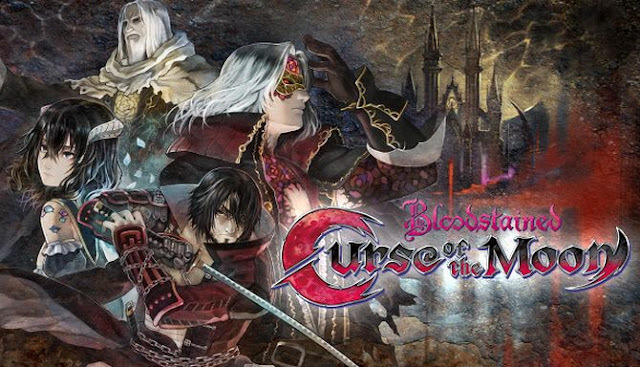 In Curse of the Moon he is on a mission to defeat a powerful demon that resides in a huge castle. Along the way he frees three other people who had been captured by the demons. Miriam is a fast whip wielding woman, Alfred is a magician with access to powerful spells, while Gebel is a vampire who is able to not only summon bats, but can turn into one. The characters can be switched between whenever you want, each having different skills and weaknesses. Zangetsu is a strong all rounder who has the most health, Miriam has a long reach and is able to slide under platforms. Alfred is the weakest of the characters and has a pathetic reach, yet his magic spells are very powerful and able to kill many enemies in just one hit, lastly Gebel's ability to turn into a bat means he can reach distant platforms the others cant. Management of the characters is key as if one dies you get sent back to the last checkpoint, however if when a character's health is low you swap them out you essentially get four lives rather than the usual one. 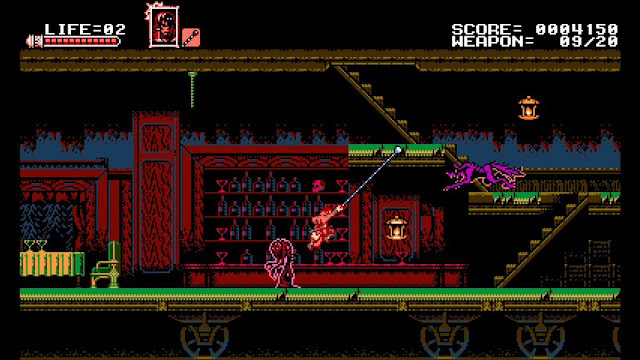 The game is split up into eight different stages, the structure most resembles Castlevania III with a map showing your progress, and with the choice of multiple characters. As this is a spiritual successor to that other series the levels and enemies can occasionally feel very similar, yet this also throws some surprises in where you go. Starting off in a train station and then a train later stages see you exploring an ancient ship, heading into an Egyptian style tomb, and traversing a ruined cathedral. The final three stages are set in a huge castle that is obviously a homage to the one from Castlevania. Every level has alternate routes through it meaning there is some replay value as it is impossible to see everything on the first playthrough. Also when you complete the game you unlock a new difficulty which in a cool twist is actually a continuation of the story. Despite going back through the same levels you have one less character to use, and the boss fights are remixed. A lot of the enemies are original, but there are many that act the same as ones from the other series. There are floating ones who can knock you off platforms, knights who throw axes, dragons, golems, zombies and various demons. Each stage culminates in a boss fight against a variety of different creatures, some of these are memorable and some faded away from memory. The game felt at its best when it was emulating what has come before, such as a fight against a succubus who attacks using blood. Other times, such as the fight against a top hatted demon in a treasure room things felt a bit strange, like the boss was imported from a different game, not quite fitting in with the tone. The game finishes with a cool final fight that requires you to use all your different characters abilities, it would have been cooler if more of the boss fights required you to actually think about which character would be best suited, though this comes in more on a second play. The game plays like the ones of old, though that can be frustrating with enemies positioned to knock you back off platforms to your doom. Levels are full of staircases and platforms and are made up of a series of rooms and chambers, if you have played an old Castlevania you will know what I mean. The plot is very basic, even so I was quite confused as the on screen text for the story didn't really make a lot of sense. Also the music is good, but nowhere near as memorable, there were a few great tunes but overall despite the quality none of the tunes stuck in the mind. If you love the retro style of video games and have fond memories of Castlevania then this is an essential purchase, it is charming and controls pretty well. However people used to more modern games will no doubt find this a bit too frustrating. With eight levels and a roughly 90 minute play time this was a fun slice of nostalgia that had some real highs, even if the level design was occasionally a bit bland.